The Segment Builder is used to create segments in Permutive. If you'd like to know more about what segments are, read our Introduction to Segments. The screenshot above shows a basic segment being set up in the builder. There are a number of features available to you when creating segments, which will be covered at a high level in this document. The best way to understand the Segment Builder is to try building a segment. Segments are built around events. 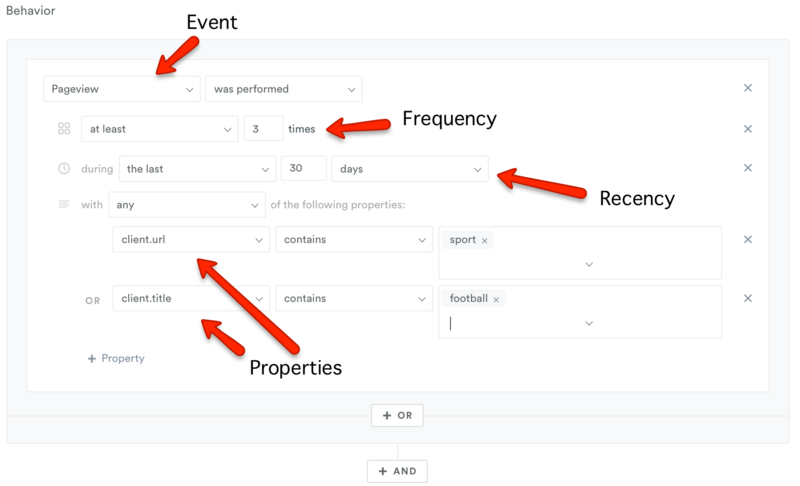 This is the first thing you need to select when building a segment, the event you want to base it on. The simplest segment you can build is one that states whether an event has been performed, or not, as shown below. The next factor you can use in segments is time. 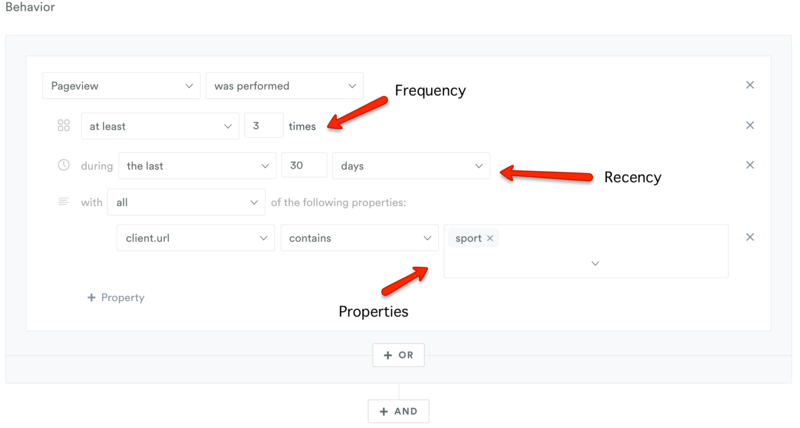 This allows you to define the recency in which a user has to have performed (or not performed) your event to be included in the segment. There are a lot of different options for specifying time range. Below is an example of selecting people who haven't performed a Pageview in the past 30 days. You can also specify the number of times a user has to have performed the action to fall into a segment. Below is an example of a user who has to have performed a Pageview 3 times to fall into the segment. Another way you can filter people's behaviour to include them in segments is using properties. When events are sent into Permutive, they include properties (eg. client.url in the Pageview event). These properties are then available in the segment builder. You can link together as many different properties as you like. Below I've specified properties around the url or title to create an example 'Sports Enthusiast' segment. What we've run through so far are the basic building blocks of a segment. 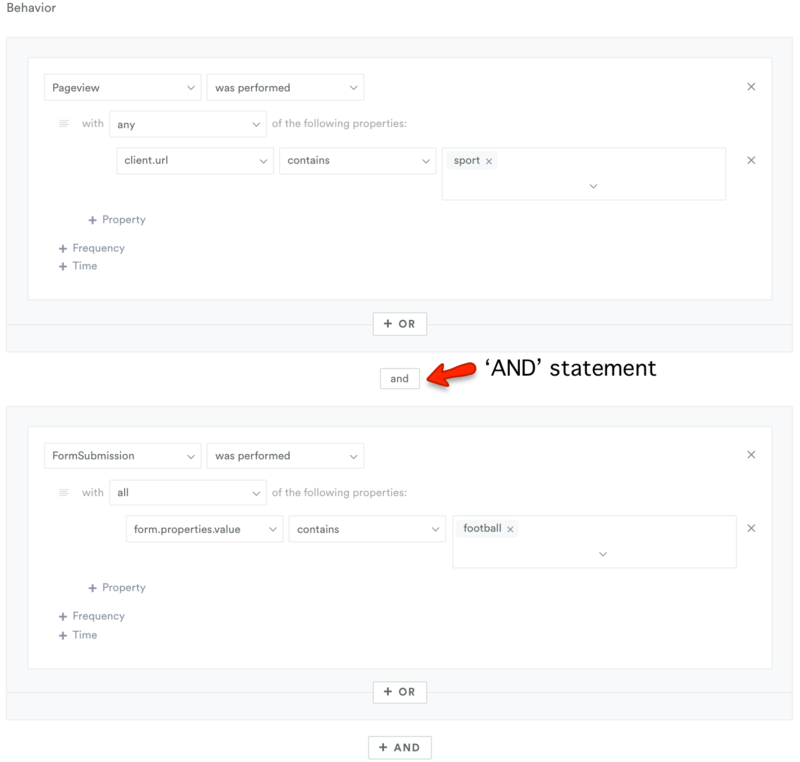 Once you've specified one criteria, you can chain as many different statements together using AND and OR rules. In the example below, I've used a few of the segment builder tools mentioned so far, combined with an AND. Once you're happy with the setup of your segment, you can see how many people would have fallen into it over the past 30 days, had your segment been set up. This is done by clicking 'Calculate' next to Audience Size. Once it has finished calculating, you'll have an idea of whether the segment you've built is suitable for it's purpose. If your segment is too small, you might want to think about broadening your criteria. In our example above. The audience for our segment is 3.8M, 5.8% of all users. The Permutive team are always on hand to help set up and optimise segments. If you'd like assistance, just click the red chat button on any page of our site.